When I was younger I really really loved My Little Pony, so I just had to jump at the chance to review this new My Little Pony the Movie Canterlot & Seaquestria Castle. It’s the exact thing that would have made my 8yr old dreams come true. Sadly I never had a castle to go with my ponies, I don’t even know if they did castles for them then, so I’m making up for it now! As you know I have two boys, and sadly although I know there’re a big thing, neither of mine are Bronies, so my dreams of playing My Little Pony with my children have never materialised. However Thomas and I did put the castle together, as he liked the look of the big box it came in and says it looks pretty cool if you like that sort of thing. Well I do, It’s beautiful. First impressions are very good. Box appeal is great. Your youngster is going to be so happy seeing this wrapped up either on their birthday or under the christmas tree. It’s relatively easy to put together, the instructions are simple but the only thing I found odd was the colours of the pieces seem to be off. I’m busy looking for a purple piece, but it’s really blue. Need a big blue piece, but its actually yellow. So you need the box handy to keep looking back at the photo and finding what colour the piece should really be. It’s weird but not a massive deal. Some pieces don’t slot together as easy as they should do, and need a jiggle about and good shove. I spent ages trying to get the sea shell thing on the lift, but it does go eventually. Maybe I’m just a weakling. Ok so once it’s all built it looks pretty awesome. Theres lots of nooks and crannies with things to do. 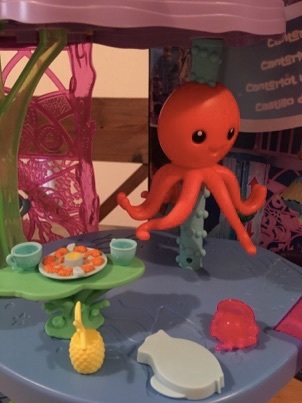 Theres a slide, three carousel type things including one disguised as a very friendly octopus.Theres a big sea shell which opens up for you to hide your treasures in. The set come with over 30 accessories like tea cups, food, jewellery, even a very cute rubber duckie swim ring, so theres lots for you to hide away or use for your games. I love that the castle is actually two distinct castles in one with Canterlot at the top, and the change to Seaquestria castle at the bottom, with the lift in-between the two. Both stages of the castle are a fair size, so the two onto of each other make it over 73cm tall and very impressive. The set also comes with Spike the Pufferfish and Queen Novo figures. 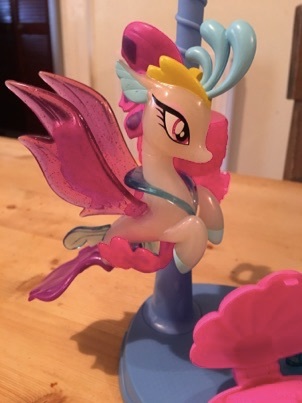 The My Little Pony Wiki informs me that Queen Novo is a female Hippogriff-turned-seapony who appears as a supporting character and is Princess Skystar’s mother in My Little Pony The Movie. Although I was a big My Little Pony fan when younger I haven’t kept up with the Friendship is Magic series. I might need to start watching that I think. Ok so now for a few niggles that I have, well to be honest the only niggles i have. The carousels. The one big wing type one on the side is obviously for Queen Novo and friends to give the impression that they are flying about underwater, considering they are half bird. However Queen Novo doesn’t work well on it at all. After a lot of trial and error I can get Queen Novo the pony figure to sit on the carousel, although its not easy you really have to jam the fins into the gap. Still once I did get her on as she’s quite large and long due to the big mermaid fin, when you spin it just hits the lift on the other side. If your lucky it just stops dead, but if not she falls out again. It’s think it’s just badly designed, I don’t think its me, although it could be just the way I’m doing it. Probably other ponies who don’t have the big mermaid tail would be fine spining around, but unfortunately I don’t have any to test so can’t say for sure. Next onto the octopus carousel, I just don’t see what its for other than to look cute. Possibly some of the other sets of figures fit on it, but Queen Novo is far to large, and the Fish just falls off. Again in a recurring theme the carousel at the top of the castle is a problem too. For once its big enough and theres nothing in the way, the figures don’t go on it properly although it is the best of the bunch. Queen Novo just lays down on it, and the pufferfish again just flies off unless you turn it at the slowest speed possibly defeating the object. The strange thing is that there are holes on it to hold the ponies on it, but no holes on Queen Novo or Spike the Pufferfish. I do remember that my old My Little Ponies did have holes in their hoofs to help them stand on things, so hopefully you could use other ponies with this set and have more luck. It is annoying that the two included figures don’t have the holes though. I understand that on Queen Novo it would be difficult but surly Spike the Pufferfish could have had a hole underneath. I feel I might be coming across as overly harsh, but if me as an adult is getting frustrated that I can’t get my ponies to ride the carousel, as a parent I see the tantrums from little ones coming a mile off. Maybe a younger child wouldn’t mind and would just enjoy that they twirl and fall off, but I’m just not sure. To be fair though thats my only real gripe. Theres a slide for the ponies to enjoy, the lift goes up and down from Canterlot to Seaquestria, A throne for queen Novo to sit on, theres a skateboard thing for Queen Novo to ride the waves that works well. I like all the little accessories, the seafood dinner party pieces with iceland style prawn ring platter are especially fun. 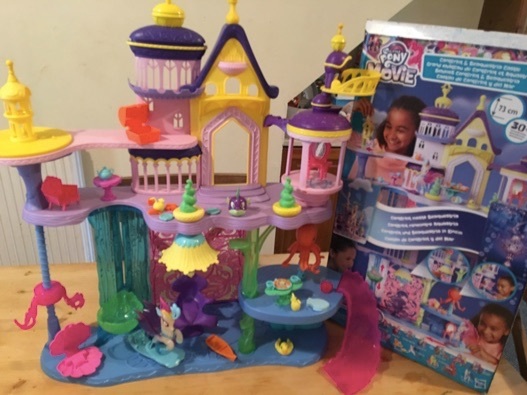 All in all I do like the My Little Pony The Movie Canterlot & Seaquestria Castle, It’s a big set which I can see younger boys and girls getting hours of play from. It’s something I would have loved to own when I was a little girl. Last week we received the most brilliantly crammed full box of loveliness. 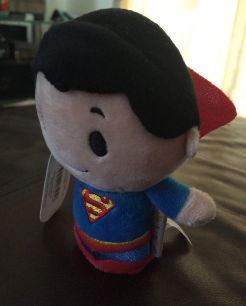 A gift from Hallmark of some of their new plush collectable toys – Itty Bittys. Itty Bittys are already a massive hit in the US and Australia, and I predict that to continue when they launch here at the beginning of October. Firstly I love the name as it’s describes the product so well. Not only are they small, but they are unbelievably cute, and I think the name perfectly encapsulates that. 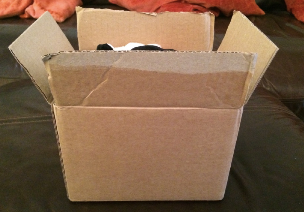 They are so small in fact that this is the little box we received to review. And guess how many Itty Bittys were hidden inside? All these guys. Seven Itty Bitty plush toys! 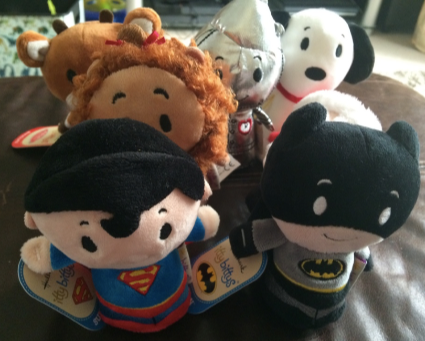 In our box was a Superman and Batman, cowedly lion and tin man from the wizard of oz, A Santa and Rudolph, plus a Snoopy. Itty Bittys have a great range of characters from comic books, films, tv shows that both children and adults will know and love. The first ranges to be released in the UK are Super Heroes, Snoopy and Charlie Brown, Scooby Doo and The Wizard of Oz. One of the first Itty Bitty characters to go on sale will be Batman, which is currently the top selling Itty Bitty in the US. I honestly love these Itty Bittys so much, and can’t wait to see them in Hallmark stores and add to my collection. The great thing with them being so small is that they don’t take up as much room as normal plush toys, even smaller ones. I have just put lots of plushies up in the attic as I’ve no room for them. It’ll be great to have a collection out that I can see and enjoy, without worrying about space. It’s all the little attention to detail that makes them so special. 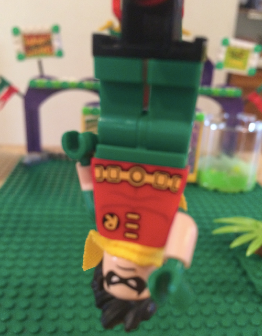 Like the fact that you can bend Batman and Superman’s cape, and it stays up so it looks like he’s flying. Also Cowardly lions mane is so curly and gorgeous, it feels so luxurious. The boys love them too. Even my husband thinks they are adorable. We’ve all argued about who’s getting which Itty Bitty character. Jacob loves them as they are easy to hold and cuddle, plus their size means he has more room in his bed at night. Although we do spend 5 minutes every morning digging them out of the bedclothes. I was surprised that although obviously Thomas and Jacob loved the Batman and Superman, they were also really into all the others just as much. Jacob loves Tinman especially, and for Thomas it’s Snoopy. Thanks to the lovely people at Hallmark I’ve got a set of Itty Bittys to giveaway to one lucky Toybuzz reader. Competition begins 15.09.15 and ends 30.09.15 at 12:00. Uk entries only. Never has getting up early before school been more worth it! This morning our lovely postman rang the bell with a special delivery from Lego for us. 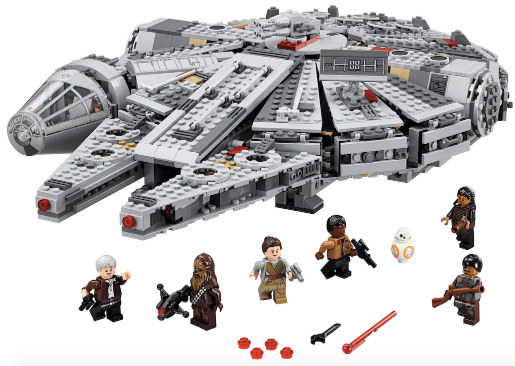 All in aid of Force Friday, the day when all the new Star Wars movie – The Force Awakens toys are released, which if you hadn’t already heard just happens to be today. We were sent Obi-Wan and General Grievous, and were thrilled with them. General Grievous is arguable the best new character from the prequels, I mean he has 4 lightsabers, you can’t argue with that. 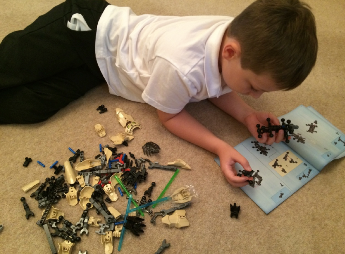 We didn’t have lots of time before school, so General Grievous is only half built so far (I’ll add a picture when he’s built). 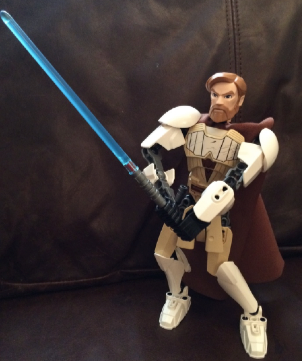 Thomas did however finish building Obi-Wan this morning, and he looks so cool. He doesn’t look like he’s built out of Lego, it looks like a brilliant action figure or model. The way he stands up and holds his lightsaber is awesome. Plus he’s so flexible, you can put him in so many battle poses. I especially like his wonderful flowing cape. The boys didn’t have any trouble putting the sets together. It probably helps that they are both huge Lego Hero Factory fans, as the Star Wars buildable figures use a lot of the same pieces, and are built similarly. 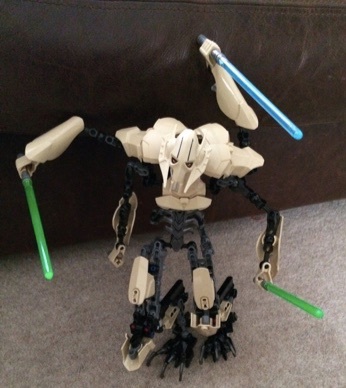 Update: General Grievous is now finished!! 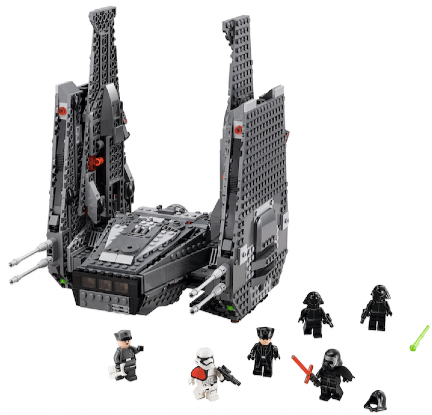 Jacob has already asked me for Kylo Ren’s Command Shuttle for christmas. He really wants a Kylo Ren mini figure, with that super cool cross lightsabre. He’s also got his eye on Poe’s X-Wing Fighter, as he’s after one of the super cute BB-8 mini figures. Plus there seems to be a lot of projectiles included, which is always a plus for him. 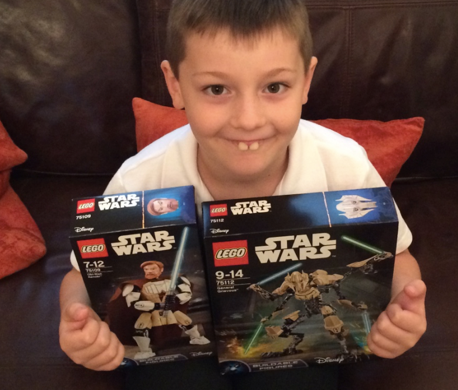 Thanks so much to Lego for making our Force Friday super! 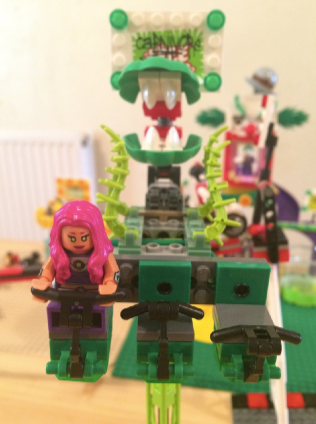 For the last few weeks we’ve been having tons of fun playing with the latest Lego set we were lucky enough to receive for review – Jokerland. 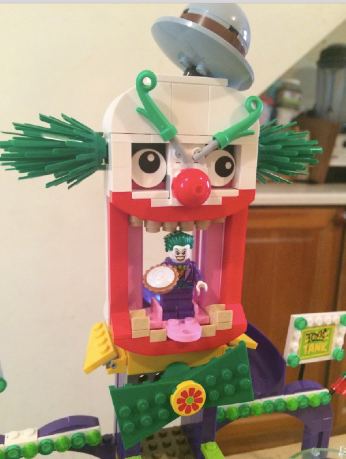 The Jokerland Lego set is totally, totally awesome. Possibly the best Lego set that i’ve seen. Having a son who’s a Lego Batman fan he literally freaked out with joy when he saw it, and wanted to get straight to work putting it together. We had tears when I said no as we were leaving that morning to go on a caravan holiday, however I explained that he had something amazing to come home to and he soon cheered up. As soon as we got home he dived straight into the box, and set about building this mammoth set. 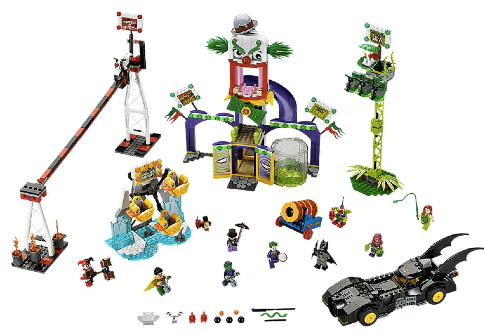 The Jokerland set comes in at a very substantial 1037 pieces, in 8 different bags inside the box. Plus two cool little guys – a Jokerbot and a tiny Penguin who holds dynamite. The manual is a little strange as usually with the big sets you get 2 or 3 different manuals, but this one is a big fat phonebook of a manual with the whole build detailed in one. I think I actually prefer it like that as it makes it easier to keep tucked away for if we need to build it again. The set is marked as an 8-14 age range, so I thought I may have to give my 7 year old Jacob a bit of help along the way. However he must be a master builder as he worked hard and built it all himself over the course of a weekend. One tip that he has for a good Jokerland build is to use a base plate or two if you have some big enough, to help keep everything together. We found that the Penguins Deadly Duckies falls apart really easily if not built on a solid plate. You obviously don’t have to, but it makes it easier. Penguin’s Deadly Duckies ride is Jacob’s favourite as he loves Penguin the most, and even laughs like him at times. The Duckies look really good, and you can spin the ride around by twisting a button at the back. 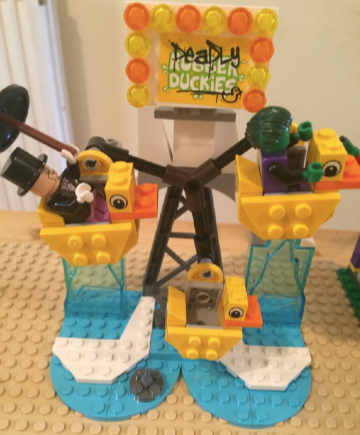 Jacob likes to load Batman and Robin into the ducks and then try to get them to be flung out by spinning the ride around as fast as he can. It’s definitely the Deadly Duckies then. My pick for the best ride would be Poison Ivy’s Carnivore Free Fall. It’s one of those tall freefall rides that most of us have been on at the funfair, only made out of a man eating plant. Plus you can’t get off the ride as your handcuffed in place. Harley Quinn on her Bike probably looks the most impressive of the rides, as it spans the whole length of Jokerland. 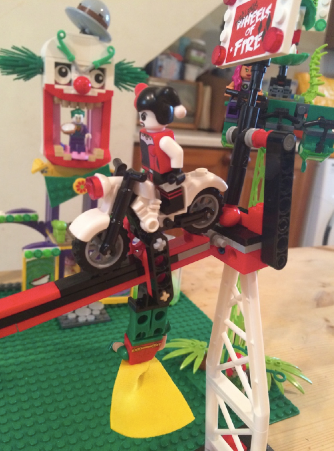 You can hang any of the mini figures onto the underneath of Harley’s bike , hanging precariously over the flaming garbage cans. Then It’s time to call Batman to save them in a daring escape. A very clever piece of Lego engineering and imagination. The main bulk of the set is taken up by Joker’s Funhouse Jokerland itself. The entrance has warped joker smile mirrors on either side. Next up is a bow tie which you can make spin, then up again is a huge Joker head with moveable eyebrows and bowler hat. Inside Jokers Mouth is a platform for his tongue which you can use as a spring to push Joker into the mouth, down the slide and into the Toxic Tank at the bottom. Or if he’s unlucky Joker can push Batman down the slide. Depends on what mood your in! Lastly the Two other things you have are a shoot-o-matic cannon which shoots out cannon balls, dynamite, even custard pies. However probably the best part of the whole set is getting an amazing looking Batmobile. It’s so awesome, and Jacob absolutely loves that he made a Lego Batmobile and that it looks so cool. The Batmobile fires missiles out of the front and the back. The front missiles are the long stick type, however the rear shoots out stud missiles. The giant batwings on the back of the bat mobile make it look “beast” as Jacob says. Another brilliant part of the set is all the little extras you get. Theres Batarangs, Dynamite, Cannon balls, custard pies, handcuffs and special handcuffs with cool locks on them. The Jokerland set has been really well thought out, it’s so creative. There is so much play potential to be had with this set. Some days Jacob has huge superhero battles, other days they are all friends and just go on the rides together. He has had so much fun and enjoyment out of the set already. He has been especially careful, much more so than usual to keep everything looking just like when it was built as it’s such a great set he wants to keep it built and together forever. With an RRP of £89.99 it’s not a cheap set, but in our opinion it’s definitely worth the money for the amount of play potential it has. Simply having the amazing Batmobile and 8 different Mini figures makes it a must have set. Obviously it’s not something I would buy on a whim, but for a birthday or Christmas gift I would not hesitate to recommend it. Thomas and Jacob went with their grandmother to see Inside Out over the weekend, and had a great time. They really enjoyed all the characters, and their personality traits being linked to the emotions. Both of them plumped for Anger as their favourite character. Apparently every time he went mad and blew off some steam it was really funny. 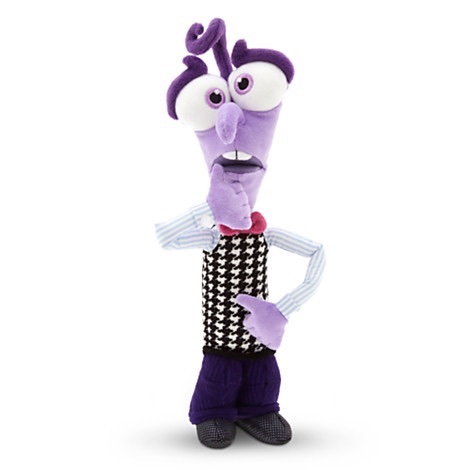 We were lucky enough to receive a really funny ‘Fear’ Inside Out plush toy to review thanks to Disney. I love Fear’s shiny shoes, which glitter and shine. Also his adorable purple cord trousers and Houndstooth sweater. Considering he has a large sticky out nose, and a piece of sticky out hair on his head, he’s surprisingly soft to hold and cuddle. For the price (£12.95) in my opinion the plush is a brilliant representation of the scaredy cat movie character. The ‘Genuine, Authentic, Original’ Disney Store badge sewn onto his sweater lets you know you have the real thing, and a high quality product. 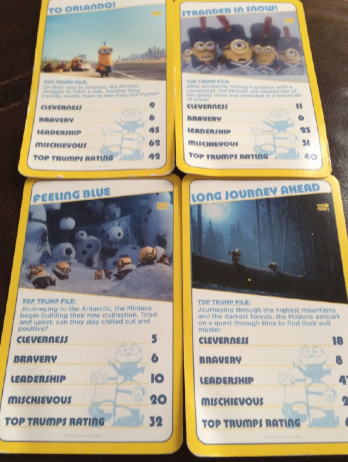 Top Trumps are still one of my favourite games to play with the boys. I’ve loved playing Top Trumps since my days in the primary school playground, and am delighted they are still around to play with my children today. 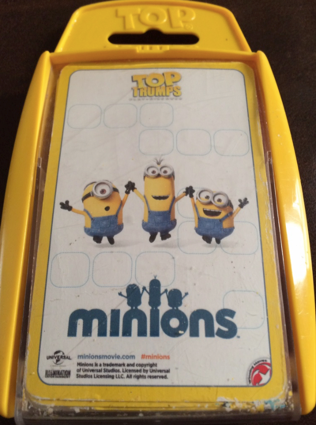 We have lots of great sets in the house already, but this week we added a new one to our collection – Minions Top Trumps. 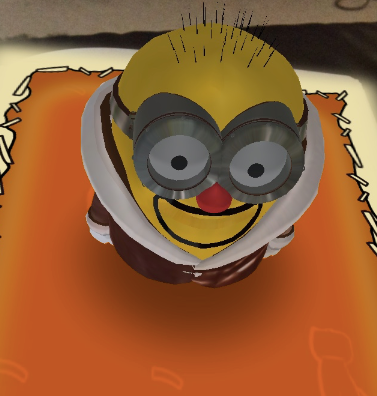 The cards all feature scenes from the new Minions Movie, so you can laugh along as you play recalling all the hilarious bits of the film. Out of all the scenes, my favourite card is ‘Serving the Pharaoh!’ as it’s the one with the Minions building the pyramids, which I thought was so funny. 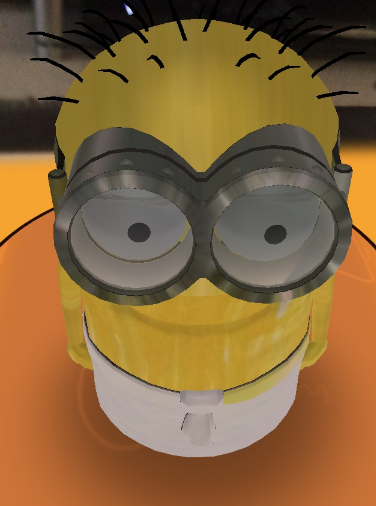 For fans of all things Minions this is the perfect game. You may have noticed from the picture that the cards look a bit battered around the edges. This is after only one week of use, so you can tell how much they have been used already. Jacob couldn’t put them down, and that was the problem. He took them to school and carried on playing with his friends even when it started to rain. I’ve had to promise to get another set as soon as I can because he loves them so much, and theres no better endorsement than that. Last week saw the much awaited delivery of our brand new Lego Bloggers box for review, and boy were we in for a treat yet again. A brilliant box full of variety I think you’ll agree. Being at home at the moment laid up with a broken foot has one big advantage – Plenty of time to build Lego (with and without the kids!) So all of the models are now made and have been fully tested to their limits. 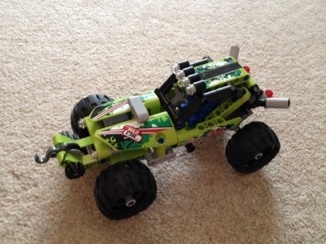 First out of the box was the Lego Technic Desert Racer. 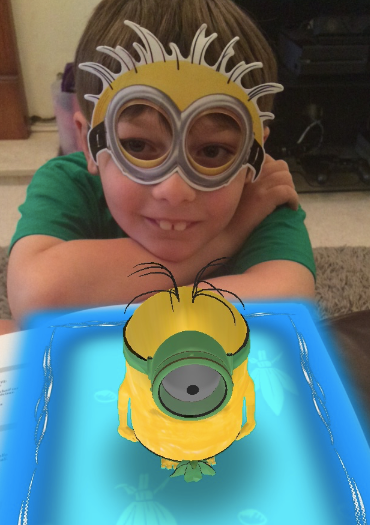 Jacob was so excited about this one, so we put this one together first. We’ve never had a Lego Technic set before, and I was afraid it would be complicated and fiddly, but lucky it wasn’t and was really easy actually. 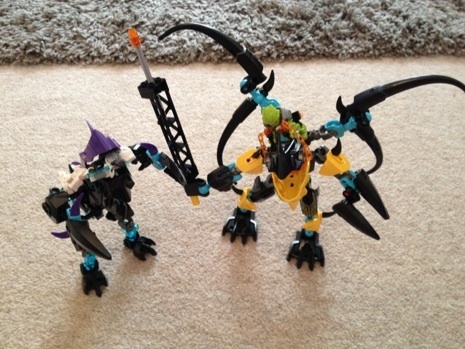 Being a bit wary of Lego Technic’s and the age rating of 7-14, I took on this build myself initially. Once I was into it and realised that it was nowhere as difficult as I’d initially assumed we all got stuck in and finished it together. The finished product took us just over 30 minutes to complete. Then we were all set to Off Road! The boys think there desert racer is super cool. The huge tyres, big exhaust pipes, and decals make this one awesome ride. They just love it and have been having a blast making ramps and watching it sail over them at top speed. It has a pull back action which makes it go really fast. Faster than you’d imagine. Theres also a working winch on the front for pulling it out of danger, or for using it to drag the Lego men along like Jacob does. Onto The Lego Movie set – Bad Cop’s Pursuit. I think I must be the only person who hasn’t managed to see The Lego Movie yet. The boys have both been 3 times with grandparents and friends, so mum and dad have been left out so far. I was hoping to take them myself, but thanks to this pesky broken foot, i’ll have to wait for the dvd now. Definitely will be getting the DVD though, as soon as it’s released. The kids both love The Lego Movie so were really excited to play out one of the best scenes with their new Lego set. With an RRP of £24.99 you get a fair amount of Lego for your money. 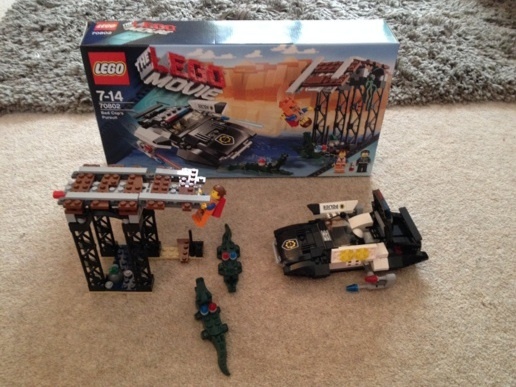 Theres 2 police mini figures, One of our Hero Emmet, 2 police crocodiles with snapping jaws, a flying police car, and a buildable bridge which you can pull out a lever to collapse. Again this was a very simple build, and only took around 30 minutes tops. That was with my help, but I think Thomas would have ben able to do it unassisted in about an hour. The fun aspect of having Emmet hanging off the collapsing bridge with the snapping police crocs waiting underneath has so much play potential. The boys and I have come up with loads of different scenarios for the Bad cop’s and Emmet to get into. 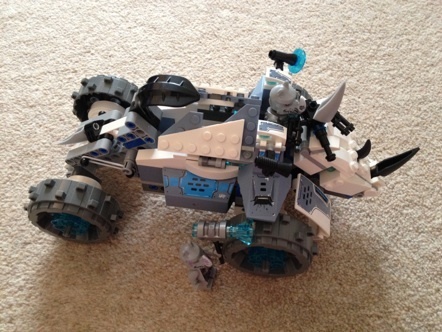 This is a great set for a young Lego lover with an active imagination. This set see’s the Rhino tribe rolling off-road in their rock flinger after the Sparcon (a creepy spider type mini figure) who’s stolen their precious Chi. The Rock Flinger is an extra special vehicle. Incredibly looking like a wheeled reinforced Rhino. The massive wheels are excellent for any terrain. Jacob has been having great fun driving it around the garden now the rain has let off for a bit. The special move that gives the Rock Flinger its name is hidden underneath the two top panels. Lift them up and out pops the rock flingers catapult arm. When loaded up with the included rock, you’ll wow as it launches across the room. A great set for Chima fans. 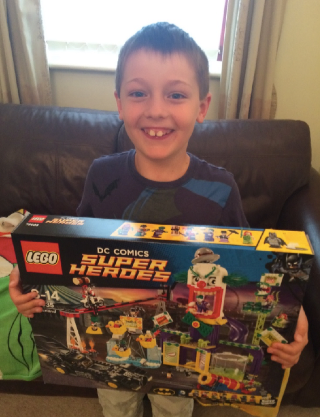 Last but not least is Jacob’s favourite Lego range – Hero Factory. 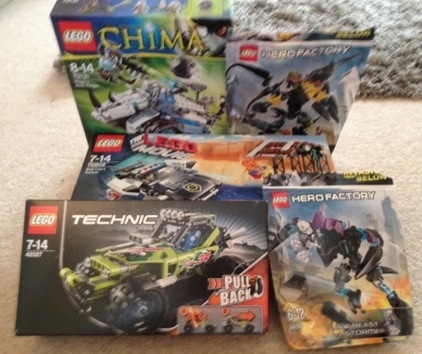 Were so lucky that the Lovely people at Lego know us so well, as each Lego Bloggers Box is personalised for each Blogger, and each box always contains some Hero Factory for Jacob! Lego always comes up with great story arcs for each new Hero Factory series, we especially loved last years Brain Attack. This time around its ‘Invasion from Below’. Gigantic monsters rising out of the cracks of a massive earthquake send the Hero Factory into action. The new sets feature small mini figure sized Hero Factory heroes for the first time, portraying how massive these monsters from below really are. The Hero Factory look puny in comparison. It’s a great new addition to the Hero Factory story. 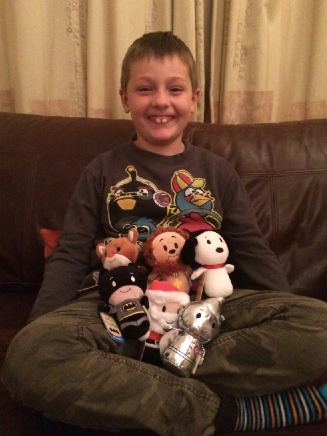 Jacob just loved his new miniature Hero Factory figures. It’s great that he can now play with Stormer and pals in his normal Lego sets too. As well as playing with the monsters, he’s had lots of fun building headquarters and vehicles for the Hero Factory now that they are normal mini figure size. 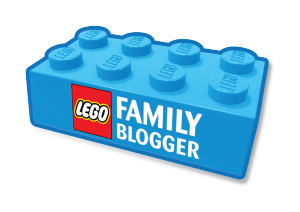 Disclosure: Thanks so much to Lego for enabling us to review these new products as part of the Lego Family Bloggers Panel. 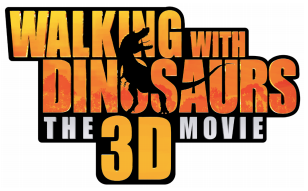 20th of December sees the release of Walking with Dinosaurs The 3D movie at UK cinemas. Something me and Thomas are really looking forward too. We’ve had that set out as a mum and son date for ages. This week we received one of the toys from the movie Ultimate Gorgon to review, thanks to Vivid Group who are the guys behind the Walking with Dinosaurs toy range. 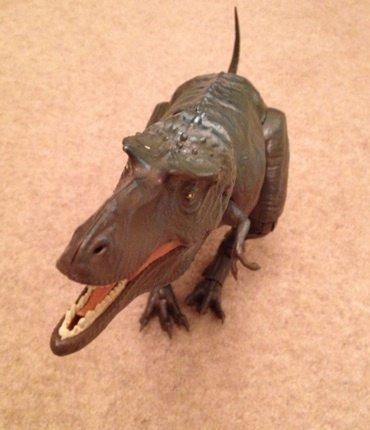 Walking with Dinosaurs aired back in 1999 on the BBC (was it really that long ago!?) So obviously Thomas didn’t see it back then, but thanks to the magic of Dvd’s we’ve both enjoyed it over and over. We were just over the moon when the 3D movie was announced, and have been looking forward to it ever since. From what I have gathered from the trailer, were expecting more of a film than the documentary style of the tv series. It will also benefit from the latest paleontological discoveries, and cutting edge technology. we just can’t wait to see what the dinosaurs will look like in 3D. Amongst the toy range are 3D movie blind bags, which come with a mini dinosaur figure and collector card. With an RRP of £1.99 they are nice little things to collect. The Gorgon stomping feet are cool dinosaur feet which you slip your own shoes into to create your very own monster Dino feet. 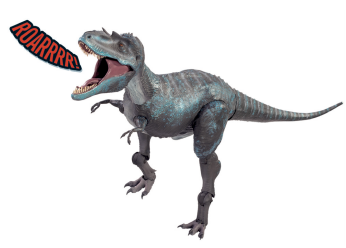 Every time you stomp around your feet will make huge dinosaur noises. Very fun, although I doubt Gorgon’s stomping can be much louder than when Thomas huffs about on the floorboards upstairs. Over to the Ultimate Gorgon dinosaur figure which for the record is 12″ high, much bigger than all the other dinosaur toys we have. Having all the Dino’s lined up together, Gorgon really does look like the scary monster dinosaur they would all be terrified of. Gorgon has an impressive 14 articulation points, so getting him to stand and claw at his victims is really easy. You can move all his fingers and toes, feet, legs, arms, tail, head, almost everything. His skin has an almost slimy feel, whilst not totally unpleasant makes me feel a little uneasy. It just feels a little bit too real. Especially when he’s been outside in the cold conservatory all night in the toy box. His skin feels so cold, it does feel like really creepy. The roaring sounds he makes just adds to the scary feeling i get. He makes about 5 realistic bone chilling sounds, and makes me jump every time. Thomas however being a boys boy thinks Gorgon is amazing! The fact he scares me a little just adds to the excitement. The boys both think Gorgon is the ultimate toy dinosaur, and have been having some bone shaking fun with him boxing around all our other toys. A big Dino sized thumbs up from the Toybuzz boys.